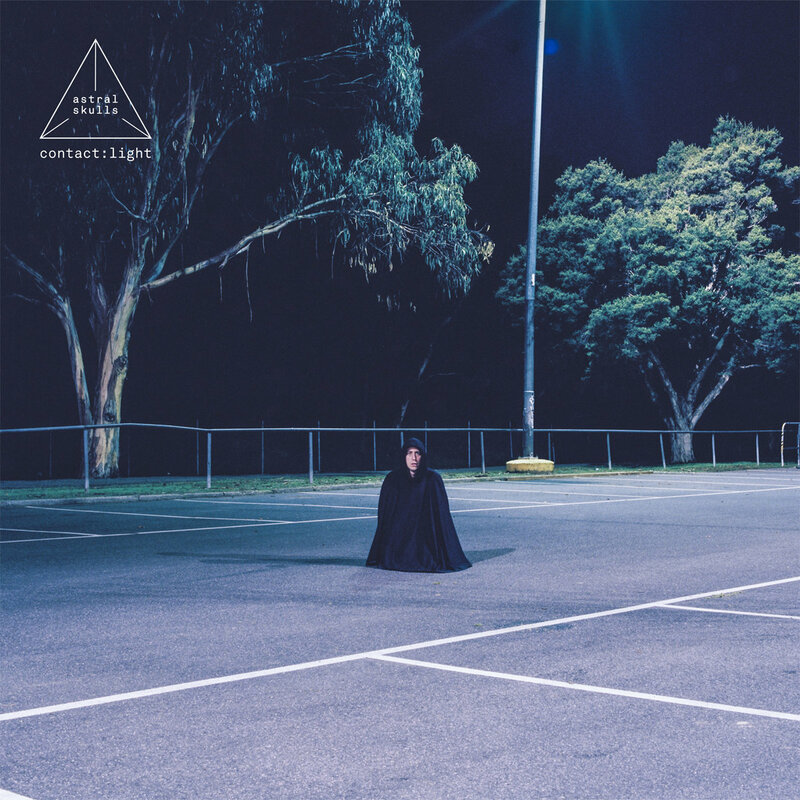 Contact:Light by Astral Skulls is a highly conceptual album that embodies the best elements of Australian ‘darkwave’ – vivid imagination, visceral musicianship and stellar execution. As far as coming forth with something intelligent and engaging, Contact:Light is a definite success. Kurt Eckhardt is a Melbourne-via-Brisbane musician who has been creating skewed pop gems as Astral Skulls for a while now. 2015 has seen the solo artist release a 7” containing singles ‘Sexism Sux’ and ‘Bite My Tongue’ and now he has come forth with a full-length offering, Contact:Light. Astral Skulls sits in the same realm as goth-synth-pop romantics as Karli White and Jonny Telafone, Astral Skulls boasts his own set of nuances and charm. While Karli and Jonny prefer to churn an R’n’B aesthetic into something twistedly beautiful, Astral Skulls looks upward, drawing inspiration from the stars, embracing the dark and the unknown and weaving it through his synthesised production. This is an album Influenced by science fiction – the old school, hard sci-fi that poses questions about our existence and the issues inherent in new discovery. By Kurt’s own account, Contact:Light is all about new discoveries and the paradigm shifts that go hand-in-hand with their unearthing. Space, life on other planets, life from other planets coming to Earth and humanity’s unpreparedness for the whole ordeal – it’s all included, morphed within the pulsing electronics and the dissonant guitar squall. Contact:Light brings together new elements to create an aura of unreality, probing the mind and the dark corners of imagination and twisting instruments to match the vibe. The album isn’t overly frenetic in pace, but the groove is insidious – it worms its way into the psyche through the pattering of the drums and the dull throb of the low end. The album runs along a loose narrative, though I’m unsure if it is all from the same point of view. Each song touches on some skewed future, but the most linear story revolves around leaving earth in search of safe haven after an invasion (I think). ‘Landing’ kicks things of in dissonant fashion, detailing the discovery of an alien relic or being which signals to its creators – bringing them to Earth. ‘Contact’ is an industrial electro tune that examines the fearfulness that emerges once confronted by contact with an alien race. Xenophobia taken to extremes – are they here to hurt us? Can they be trusted? Can our own race be trusted? Compelling stuff. ‘In The Sky’ is probably the most beautiful song on the album in my opinion. It touches on the romanticised idea of leaving the earth behind to explore the stars, the courage of going on a journey from which one would most likely not return. ‘Terraform’ takes this one step further as it grimly alludes to the mass evacuation of the planet. Some are lucky, some are left behind (“they said we would live forever / everybody else will die”). Mid-way through Contact:Light is ‘Worlds Away’ – a slice of tempestuous guitar and driving drum machine rhythm. It offers a disassociated take on life, feeling alien within one’s own skin or on a new planet. ‘The Other Side’ is a pulsing gem that boasts a sonic palette of video game bleeps and bloops, mixed with sinister synth undertones (picture chiptunes gone real bad). It’s another track about space travellers traversing the unknown, making discoveries that shake beliefs and makes one question reality. Conceptually, Contact:Light is an enthralling album that harkens back to the golden age of science fiction writing and film. It’s part 2001: A Space Odyssey and part Invasion of the Bodysnatchers. Sonically, the work is appropriate for the concept and is an overall enjoyable listen for those who enjoy darkwave electronica, drone pop or confronting song writing. Kurt / Astral Skulls is an interesting musician whose dedication to crafting a tale over a whole album is commendable, as it isn’t something you see too much of these days. The idea of a concept album is a gamble, but Kurt knows his audience and as far as coming forth with something intelligent and engaging, Contact:Light is a definite success.